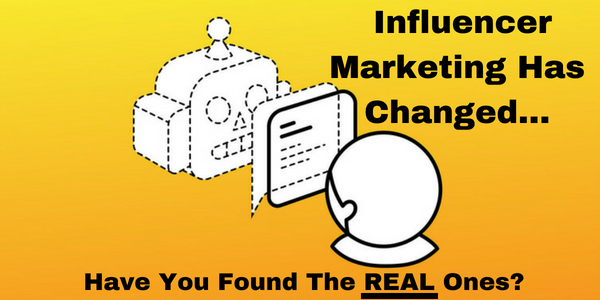 Back in 2013 and 2014 Influencer Marketing started to become big and you simply had to reach out via email to a person with a blog or YouTube channel that had a large social following and a lot of web traffic and get them interested in reviewing your product. A few weeks later, after you sent the product, the review would come in and become a win, win for everyone. You have gotten SEO juice with links, linking back to your website as well as exposure from a ton of new eyeballs while the influencer got a free product, perhaps affiliate and review money as well as content to fill their blog. Now times have changed. Influencers are a dime a dozen and everyone thinks they have an impactful voice with a large audience. The problem is, many influencers in fact have fake followers or bots and not real humans following these bloggers and vloggers. So as a marketer, how do you know if an influencer is really influential or just putting up a front within the World Wide Web? Don’t worry so much about follower count and look more at impression data. One example on how to achieve this is by asking the Influencer for a screenshot of their Instagram Business Pages Insights, which provides impression data. If they have 50,000 followers but their impressions are in the low hundreds, there is a good chance a majority of their followers are fake. Look to see what type of engagement the influencer has on their social networks. If there are a ton of postings but very little engagement, especially commenting, they probably are an influencer with little or no ROI value. That’s because bots simply build up page likes. They usually don’t know how to engage with content. Like it or not the “follower popularity” model is no longer acceptable when it comes to Influencer Marketing and it’s more about quality followers and quality engagement compared to simply looking like you have a million and one fans when in fact you really don’t. For a detailed influencer marketing strategy for your product or brand contact The Interactive Imprint today at 954-254-1650 or visit TheInteractiveImprint.com.